Hello everyone! I hope you all had a wonderful weekend. Today we had an early afternoon dinner. We had meatloaf, baked potatoes, broccoli and a salad. The meatloaf was so delicious and this recipe is a family favorite that I would like to share with you. Here is what the cooked meatloaf looked like when it was done. 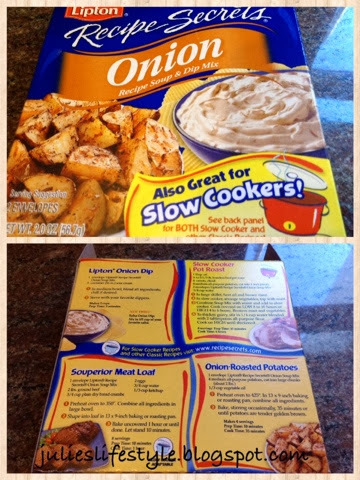 My secret ingredient is a packet of onion soup mix and the recipe is on the back of the box. I have been using this recipe for a long time. Here is what the meatloaf looked like sliced up with a baked potato on the side. Preheat oven to 350 degrees. Combine all ingredients in large bowl. Shape into loaf in 13 x 9 inch baking or roasting pan. Bake uncovered 1 hour or until done. Let stand 10 minutes. 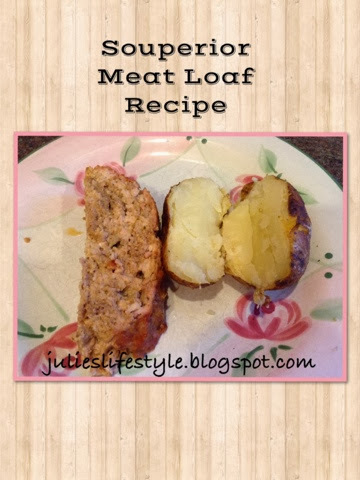 Delicious looking and delicious sounding meatloaf recipe, Julie! You are a very savvy and resourceful cook! Thanks for sharing and have a happy week! We love meatloaf in our family. I had forgotten about this recipe. Thank you for sharing it today. Our Mom taught us to make meatloaf this way! It makes for the most delicious meal ever. Thanks for coming by BeBetsy to see our onion rolls. We encourage you to give them a try. Feel free to ask any questions you have on the comment area - we would be happy to help. This looks great. I'm a meat loaf fan, too, and I think the perfect go-with is a baked potato. It's the perfect weather to turn on the oven and bake meat loaf and potatoes. Oh yummy - this looks so delish! We love meat loaf especially now that the weather is cool here! Hubby and I do like meatloaf every once in a while. I have two fav recipes, but will give this one a try. Like new and different! Thanks for sharing with SYC. Looks yummy Julie! Thanks so much for sharing at the Krafty Inspiration Thursday party. I can’t wait to see what you’ve been up to this week. My husband could've used this recipe last week. He tried a different meatloaf recipe than what I usually make, and it was jut missing something... lol Anyhoo, thanks for sharing at Submarine Sunday!! Hi! 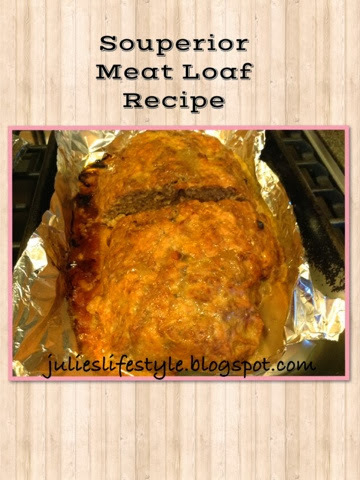 Julie, I love learning about others secret meatloaf recipes.Meatloaf is pure comfort for me. I am visiting from The YUCK Stops Here! So happy to meet you. Meatloaf is my husbands' favorite thing to have for dinner, and I can tell from your recipe, he would love it! Thanks for linking up to “The Yuck Stops Here” party. I Hope to see you at this weeks party. We are up and running at 6 pm EST on Monday. Can’t wait to see what you share!